As most of you are aware by now May is National Bike Month, and this year May 14-18 is Bike to Work Week, with Bike to Work Day on Friday, May 18, 2012. If you have ever considered biking to work in the past but never taken the plunge this would be a great opportunity to do so. Meet and ride with others who commute by bicycle to and from work, get some fresh air, exercise and save a few dollars in the process. Three "bike bus" routes have been planned, a bike bus is a group of people who cycle together on a set route following a set timetable. 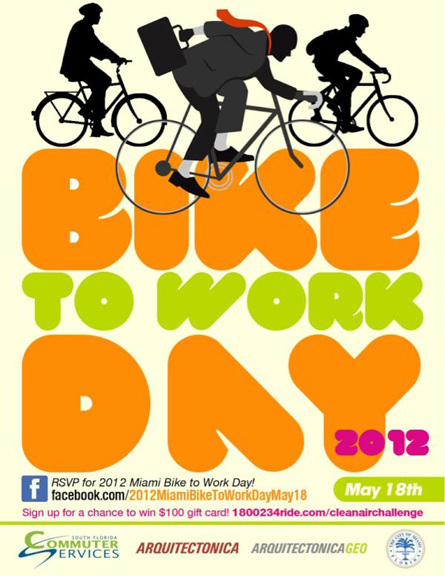 For more information on Miami Bike To Work Day go here.